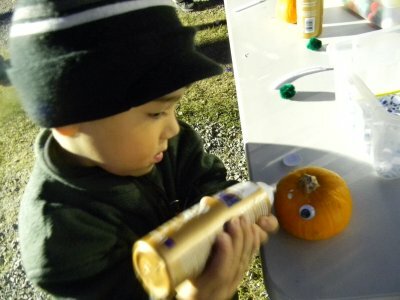 Papa, Mamu, and Cameron were attending a church fall festival, and Cameron decorated a little pumpkin. The pumpkin has different-sized eyes, a nose on the side of its head, and fuzzy hair on the stem. He is a special and well-loved pumpkin.